Election Day is coming up on November 8, 2016. And in many states, the deadline to register to vote is soon. As in, today or tomorrow. If you’re not registered yet, you can go to Vote.org which will help guide you through the process. Or you can take a look at our list below and find your state. 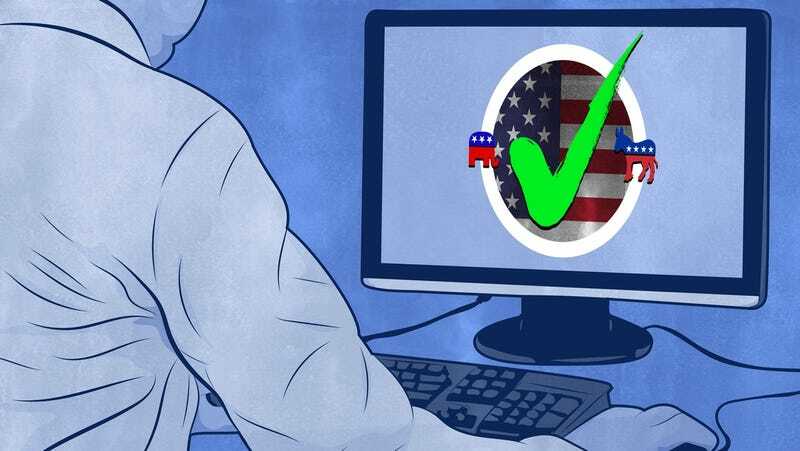 Most states let you register online, but you have to act fast. If you’re not registered yet, do it today. We promise it only takes a few minutes. Can you register online? Yes. You can register to vote online in Alabama here, if you have an ID. If you don’t have an ID you need to fill out and send in this form. You can register to vote online in Alaska here, if you have an ID. If you don’t have an ID you need to go here and send in a paper form. You can register to vote online in Arizona here. Can you register online? No. Deadline to register: In person, October 10, 2016; By mail it must be postmarked by October 11, 2016. To register by mail to vote in Arkansas you need to fill out this form and make sure it’s postmarked by October 11, 2016. You can register to vote online in California here. You can register online to vote in Colorado here. You can register to vote online in Connecticut here. You can register online to vote in Delaware here. You can register online to vote in DC here. You can register to vote in Florida by filling out this form. You can register online to vote in Georgia here. You can register online to vote in Hawaii here. You can register to vote in Idaho by mail by filling out the forms here. You can register online to vote in Illinois here. You can register online to vote in Indiana here. You can register online to vote in Iowa here. You can register online to vote in Kansas here. You can register online to vote in Kentucky here. You can register online to vote in Louisiana here. To register by mail to vote in Maine you can fill out this form. You can register online to vote in Maryland here. You can register online to vote in Massachusetts here. You can register by mail to vote in Michigan here. You can register online to vote in Minnesota here. You can register by mail to vote in Mississippi here. You can register online to vote in Missouri here. You can register by mail to vote in Montana here. You can register online to vote in Nebraska here. You can register online to vote in Nevada here. The state of New Hampshire allows you to register by mail, though the deadline listed on the Secretary of State’s site are hazy. Instructions on how to register to vote in New Hampshire are here. You can register by mail to vote in New Jersey by using the forms here. You can register online to vote in New Mexico here. You can register online to vote in New York here. You can register by mail to vote in North Carolina by using the forms here. You can just show up and vote in North Dakota on Election Day, provided you bring a photo ID. You can register by mail to vote in Ohio by using the forms here. You can register by mail to vote in Oklahoma by using the forms here. You can register online to vote in Oregon here. You can register online to vote in Pennsylvania here. You can register online to vote in Rhode Island here. You can register online to vote in South Carolina here. You can register by mail to vote in South Dakota by using the forms here. You can register by mail to vote in Tennessee by using the forms here. You can register by mail to vote in Texas by using the forms here. You can register online to vote in Utah here. You can register online to vote in Vermont here. You can register online to vote in Virginia here. Deadline to register: October 10, 2016 for online registration, but if you miss that, mailed forms can be postmarked by October 11, 2016. You can register online to vote in Washington here. You can register online to vote in West Virginia here. You can register online to vote in Wisconsin by filling out the forms here. You can register by mail to vote in Wyoming by filling out the forms here. Correction: This post originally misstated that you couldn’t register to vote in New Hampshire by mail. You can, though you still can’t register online.